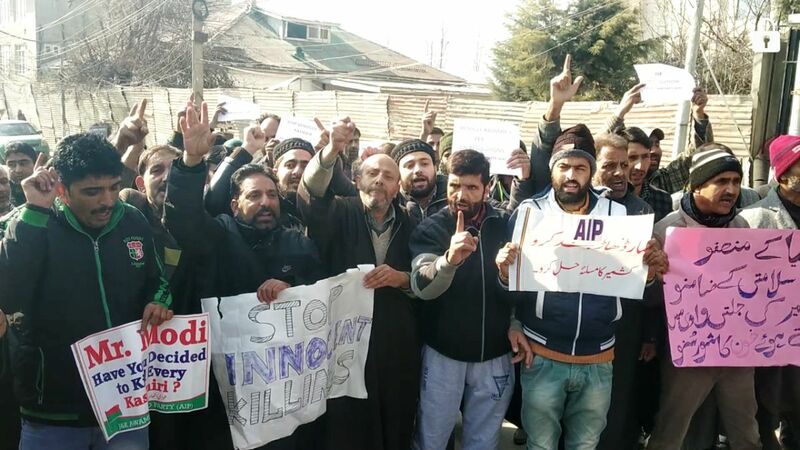 Police on Sunday foiled UN march of the Awami Ittehad Party (AIP) and detained Er Rasheed along with several activists of the party protesting the killing of seven civilians in firing by government forces in Pulwama district of south Kashmir. “Protesters carrying banners, placards, and black flags started a march from Rajbagh and proceeded towards UN office in Sonawar but a large contingent of police stopped the procession near Zero Bridge and took Er Rasheed and other party activists in custody and lodged them in police station Rajbagh,” said party spokesman. The protestors, he said, were chanting slogans against security forces and seeking implementation of UN resolutions to end the bloodshed. The spokesman said, before his arrest Er Rasheed while talking to media condemned the killings and said that world community should take notice of massacres taking place in Kashmir. “Delhi must stop enjoying killings of Kashmiris and driving entertainment from massacres of innocent Kashmiris. Neither Delhi wants a political resolution nor gives space to peaceful protests and resistance,” Er Rasheed added. Er Rasheed condemned Army Chief Bipin Rawat’s statement trying to justify the killings and reminded Bipin Rawat and ADG law and order that J&K dispute is not about controlling mobs without giving political resolution to the seventy-year long-pending dispute. Calling stone palters as terrorists means simply encouraging men in uniform to do what they want. Er Rasheed asked state police to answer if it doesn’t allow even peaceful processions then what is the alternative and does not this arrogance and colonial mindset give rise to violence. Er Rasheed added that since Army is directly involved in the Pulwama massacre, the party will hold a peaceful day-long sit-in outside Army Headquarters Badami Bagh tomorrow against the complete lawlessness and misuse of dirty AFSPA. Meanwhile, the party spokesman said that workers led by Najam-U-Saqib, and others also carried out protests in Chenab Valley at Banihal, Baderwah, Sartal and other places to condemn the killings and express solidarity with the families of Pulwama victims.